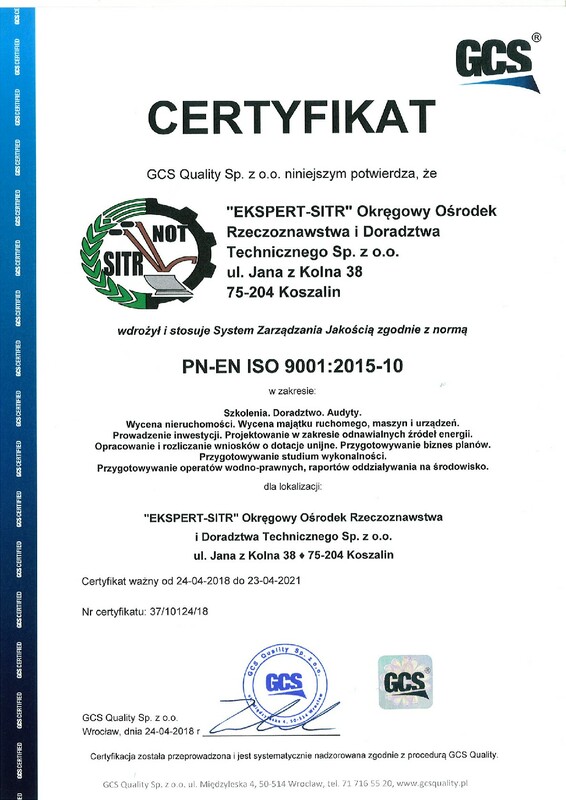 As a consulting company, EKSPERT-SITR Spółka z o.o. (limited liability company) in Koszalin came into being on the 1st of March 1992 as a result of transformation of "Okręgowy O?rodek Rzeczoznawstwa i Doradztwa Rolniczego SITR" (Regional Centre of Expertise and Agricultural Consulting, Polish Association of Agricultural Engineers and Technicians (SITR) ), which had been already on market since 1956.
appraisals of real estates and devices. Carrying out statutory aims and assignments of our company is possible thanks to generating excellent contacts and substantive cooperation, and organizational and technical with research and development centres, agricultural advisory centres, educational establishments in Poland. Experts and appraisers from scientific environment and practitioners who confirmed their professional predispositions by national qualifications and references from exclusive technical and scientific environment of NOT association (Polish Federation of Engineering Associations) take part in implementation of our works. EKSPERT-SITR has partner contacts with public administrative units of different levels, and also extensive practice in cooperation with bodies of local government administration of all levels. In addition, we have many successes in carrying out orders and commercial assignments towards subjects active in the area of agriculture and other branches of economy. Our company carried out about 3000 professional analyses regarding proposal appraisal, economic and legal expertise, operators of the atmospheric air protection, environmental impact assessments, expertise relating to waste management.